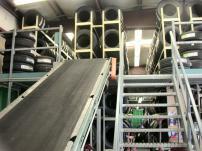 Sullivan Tire Company operates over 40 retail tire store locations throughout New England. Each retail location keeps over 1,500 tires in stock, as well as parts for complete automotive servicing including: tires, brakes, emissions, heating/cooling, transmissions, shocks/struts and more. Their challenge is to fit that large volume of tires and parts into a variety of relatively small retail locations. Preferred Equipment helps them solve this problem with a two-level Speedi-Bilt Rivet Rack Mezzanine System that is custom designed for each store. 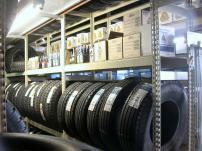 The mezzanine is designed around the existing building parameters and integrates tire and parts storage in one system. 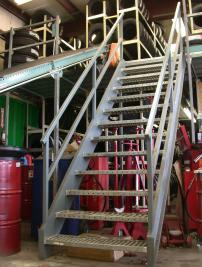 An incline conveyor is provided, when space allows, for transport of the tires from floor to mezzanine level. "Preferred Equipment has helped us set up about a dozen of our retail store locations. For projects like this, I have found it better to tell Preferred Equipment what I am trying to do, rather than what I want. Then, they provide the solution."